Colts make the NHL Preliminary Central Scouting list. - Very Barrie Colts | A website covering the Barrie Colts of the OHL. Home Barrie Colts blog Mackenzie Blackwood NHL OHL Rasmus Andersson Roy Radke scouting Colts make the NHL Preliminary Central Scouting list. Colts make the NHL Preliminary Central Scouting list. Today, the NHL announced its Central Scouting's preliminary rankings for the upcoming season. This list is made every year to get an idea of what players to watch headed into the upcoming NHL draft. This list included 41 players total from the Ontario Hockey League. Here is how they break down. Players with an A rating are projected to go in the first round of the draft. Players with a B are projected to go in the 2nd or 3rd round and players with a C are projected to go in the 4th/5th or 6th round. Of the 41 players from the OHL that made the list, 3 of them are Barrie Colts. Rasmus Andersson who was given a B rating, Mackenzie Blackwood who also received a B and Roy Radke who received a C rating. Rasmus Andersson was drafted by the Barrie Colts in the 2014 CHL Import Draft in the first round #37 overall. This is his first year with the team having spent his playing career in his hometown of Malmo, Sweden in the Allsvenskan hockey league which is one of the top leagues in Sweden. He also represented Sweden in last years World Junior Championships -18. There has been a lot of hype about him coming to Barrie and no doubt that cracking this list will only motivate him to have a huge debut season with the Colts. 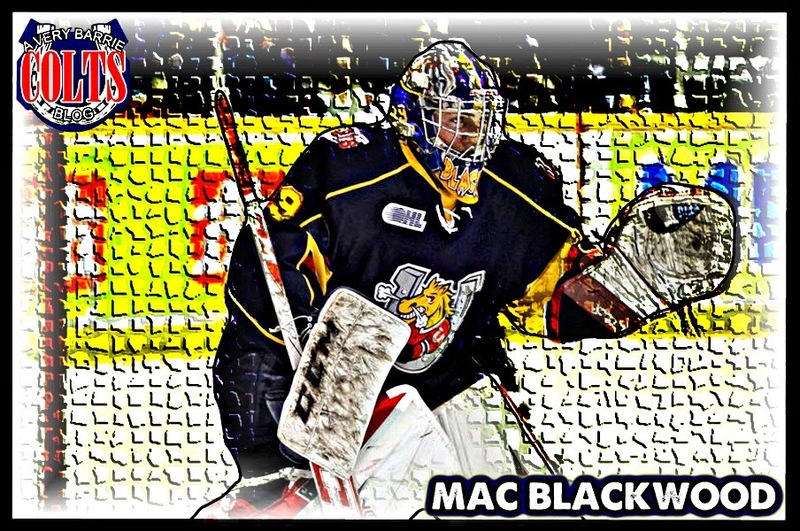 Mackenzie Blackwood was drafted by the Barrie Colts at the 2012 OHL Priority Selection draft. He was selected in the 5th round, 96th overall. Last season for the Colts, Blackwood had an incredible year with the team. He finished the season with 23 wins in 45 games played, a .902 SAV%, 2.98 GAA and 1 shutout. Not a bad season and when the playoffs came he really stepped up. The team is confident that he will improve more this season and as a part of the list you know he will do everything to improve his game. Roy Radke was drafted by the Barrie Colts in the 2012 OHL Priority Selection Draft as well. He was selected in the 12th round at #243. Then, in 2013 he was Drafted by the Indiana Ice of the USHL in the entry draft. This off season he decided that he would commit to the Colts. Last year he played in the USHS Shattuck St. Mary's Midget Prep where he tallied 19 goals and 40 points in 49 games played. Will be an exciting year to watch these guys and see how well they play this season. Hopefully making this list will only help them improve and it will be good to see how the new guys can contribute to the team. For the entire list of the CSS preliminary rankings, go to the NHL site here.